Norton school was in need of additional classroom facilities to cater to an increasing number of students. Due to the schools current site area being full it was decided that the nearby former Brooklyn House Youth Centre building would be utilised to provide a satellite school facility. 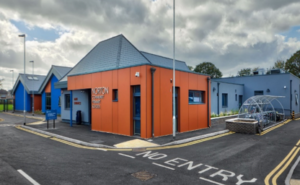 The project entailed the full renovation and upgrading of the existing building with a large extension out towards the field to provide a new state of the art education facility. New distribution equipment and sub mains and coordination of a new power supply being brought into the building whilst maintaining the supply to an adjacent Scout meeting house. Above ceiling galvanised cable containment systems. All cable drops were contained within flush fixed galvanised conduits. New LED lighting to the interior, exterior façade and car park areas. Small power installation including new surface mount dado trunkings and supplies to ancillary equipment. New heating, hot & cold water services, ventilation systems, above ground drainage and sanitary ware equipment.